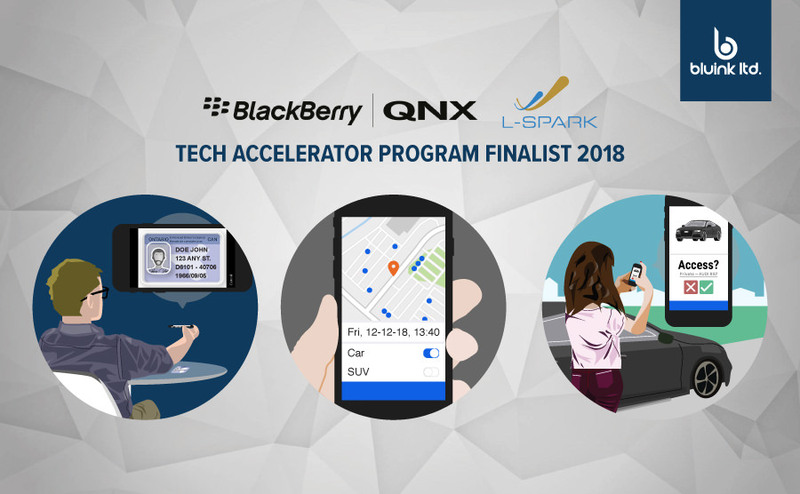 We’re excited to announce that Bluink was chosen to participate in a new accelerator program by BlackBerry and L-Spark. The program will enable Bluink to collaborate with BlackBerry QNX to develop car sharing capabilities into automobiles using eID-Me’s mobile identity verification and digital identity platform. This will make car sharing more convenient, more secure, and more accessible for everyone. Using the eID-Me mobile app, the user takes a selfie, and scans their ID documents, including driver’s licence. Their identity is verified in minutes with eID-Me’s identity verification service. When the eID-Me identity is issued, verified identity information, such as name, address, age, and licence number, is securely stored in the user’s smartphone. The user browses a list of available vehicles on the car sharing website. The user taps on the vehicle they want to reserve, which triggers an eID-Me transaction. The transaction creates a secure booking key for the automobile and allows the car sharing site to obtain the user’s verified name and driver’s licence information. At the reservation time, the user approaches the booked vehicle and accesses it by tapping on their eID-Me app. The car sharing application running in the QNX system on the car connects with the user’s smartphone and uses it to unlock the booking key with a secure eID-Me transaction directly with the car. Once the transaction is complete, the doors are unlocked and the engine can be started. No passwords are required. No key fobs or key cards need to be mailed. No standing in line at a rental agency either. Only the user with the reservation can securely access their reserved vehicle during the reserved time. The Bluink eID-Me car sharing solution for QNX works with fleet-managed and individually-owned vehicles. Car sharing is the future. Car sharing is a huge opportunity, but there’s room for improvement. Car sharing users don’t want to wait weeks to receive their key card in the mail, and they don’t want to wait in long lines at the airport to get a rental. They value the convenience of car ownership with the cost-effectiveness of car sharing. Vehicle lenders don’t want their vehicles getting trashed or stolen. They need security and peace of mind, knowing that their vehicles are safe with trusted borrowers. and by transforming the user’s phone into their access key. and by using the most secure access methods to ensure that only the right user can access the reserved vehicle during the reserved time. We’re building convenient and secure car sharing into every vehicle so that car sharing can be accessible to all. “As part of the new accelerator program, BlackBerry will help each of the finalist companies research and develop product prototypes in areas such as robotics, device security, sensor fusion (e.g. lidar, radar, cameras and GPS), functional safety, analytics, medical devices and autonomous vehicles. Learn more about the BlackBerry / L-Spark accelerator program. Global Market Insights, Inc., “Car Sharing Market worth over $11bn by 2024,” April 16, 2018, https://www.gminsights.com/pressrelease/carsharing-market, accessed November 30, 2018. PR Newswire Association LLC, “Global Car Rental Market 2018-2022: Trends, Challenges & Drivers - Market to Grow at a CAGR of 17.52%,” Jan 15, 2018, https://www.prnewswire.com/news-releases/global-car-rental-market-2018-2022-trends-challenges--drivers---market-to-grow-at-a-cagr-of-1752-300582462.html, accessed November 30, 2018.
Business Wire, Inc., “Global Passenger Vehicle Market 2018-2022: Emerging Crossover Segment Driving Market Growth - ResearchAndMarkets.com,” May 14, 2018, https://www.businesswire.com/news/home/20180514006139/en/Global-Passenger-Vehicle-Market-2018-2022-Emerging-Crossover, accessed November 30, 2018. BlackBerry, “The Results Are In: BlackBerry and L-SPARK Announce Seven Finalists Selected For New Tech Accelerator Program,” December 12, 2018, http://blogs.blackberry.com/2018/12/the-results-are-in-blackberry-and-l-spark-announce-seven-finalists-selected-for-new-tech-accelerator-program/, accessed December 12, 2018.